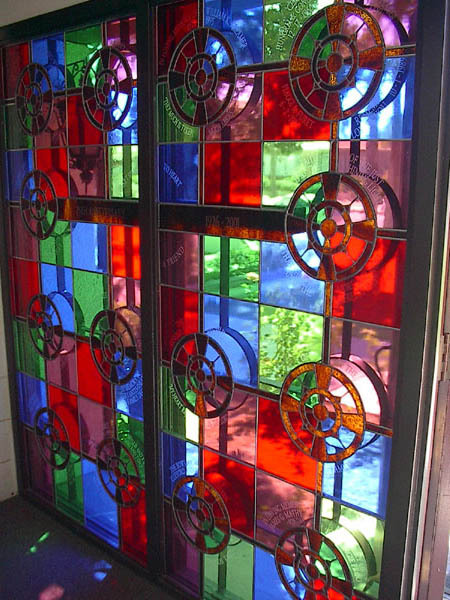 Being surrounded by beauty enhances your spiritual life. 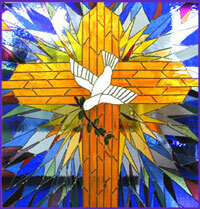 Consider a gift of glass art to your place of worship. 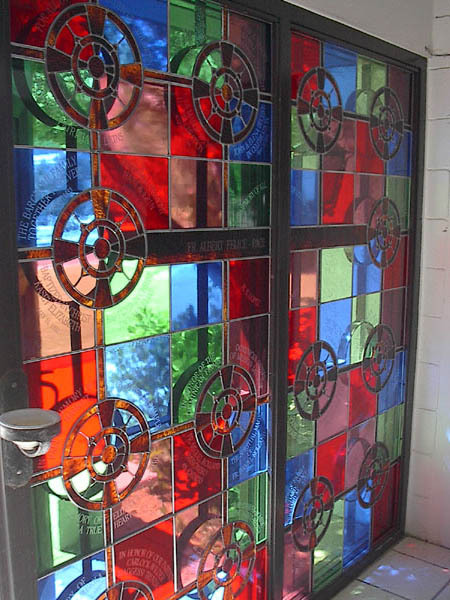 Call for an appointment to discuss ways in which your church, synagogue, or other holy place can be made more beautiful with a stained glass window or art glass mosaic piece. 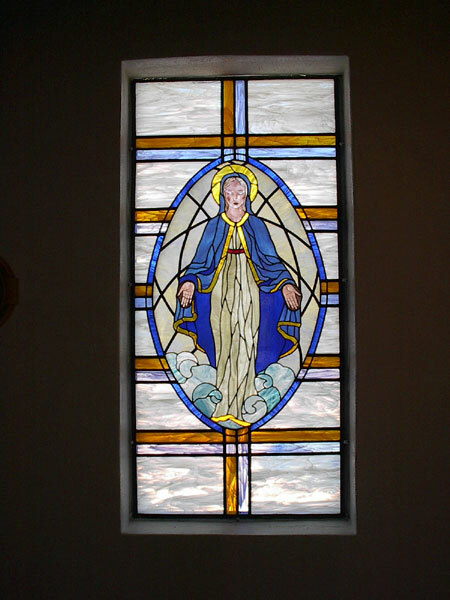 A series of stained glass panels were designed and created by Ochoa Stained Glass Artists for the Assumption of Mary Chapel, located in a small historic Southern Arizona parish. 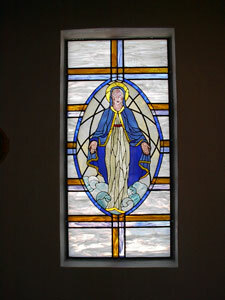 The two panels shown here include hand-painted faces, hands and feet to add detail and warmth to these glass art renderings of the Virgin Mary with Baby Jesus and the Ascension of Mary into Heaven. 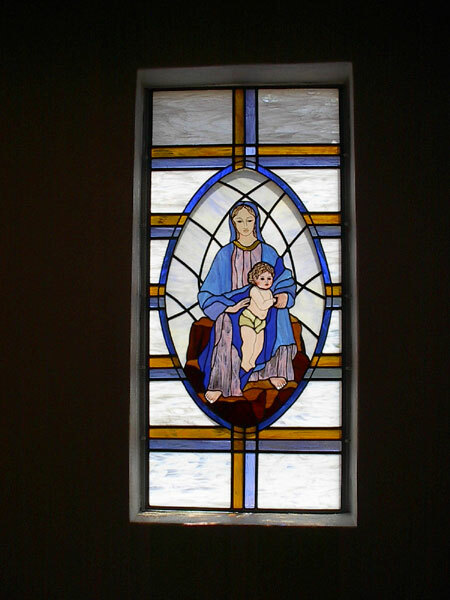 This beautiful window was commissioned by a widow in loving memory of her late husband. It was designed to capture the exuberant light of the descending Holy Spirit, and is placed in a light box above the baptismal in a Baptist church in Tucson, Arizona. 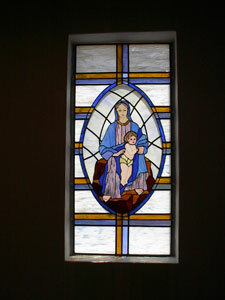 A stained glass tryptic designed for the Eucharistic Chapel at St. John the Evangelist Catholic Church in Tucson, Arizona. 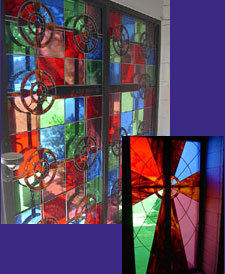 The project created by Sister Diane Bridenbecher and parishioner Margaret Kish with design inspiration from Ochoa Stained Glass Artisans, not only funded the beautification of the center, but also raised more than $25,000 for the Father Albert Felice-Pace Scholarship Fund. 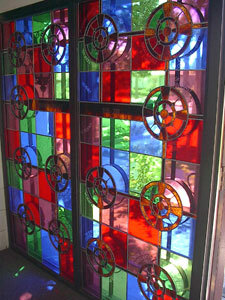 The southeast entryway of the Newman Center at the University of Arizona, one part of a group of over a dozen windows transformed through the generous contributions of parishioners, in this extraordinary beautification project created as a part of the Center's 75th Anniversary celebration. 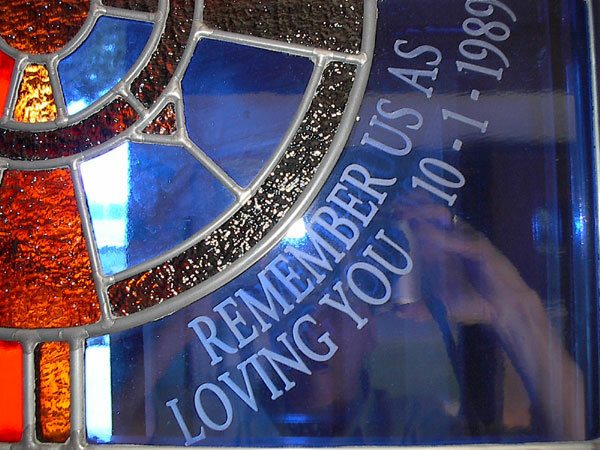 A close up section of the sandblasted segments that memorialize parishioners, from one of the more than a dozen stained glass panels created for the Newman Center's 75th Anniversary celebration. 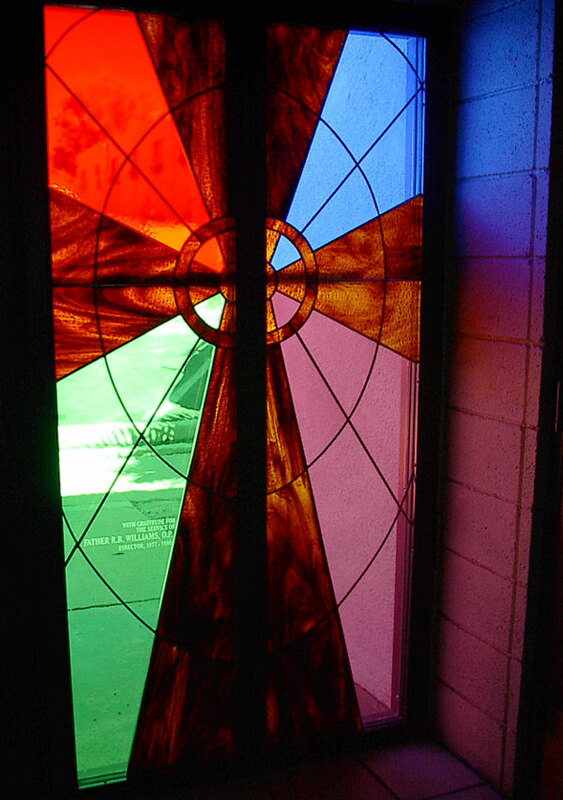 Parishioners purchased segments of a window panel, and in doing so, memorialized loved ones while contributing to the Newman Center beautification project. 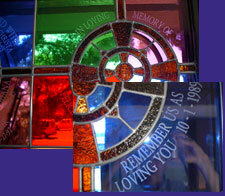 A loving tribute in sparkling stained glass made "In Loving Memory of Susan Camille Transik" by her parents as a part of The Newman Center's 75th Anniversary Beautification Project. 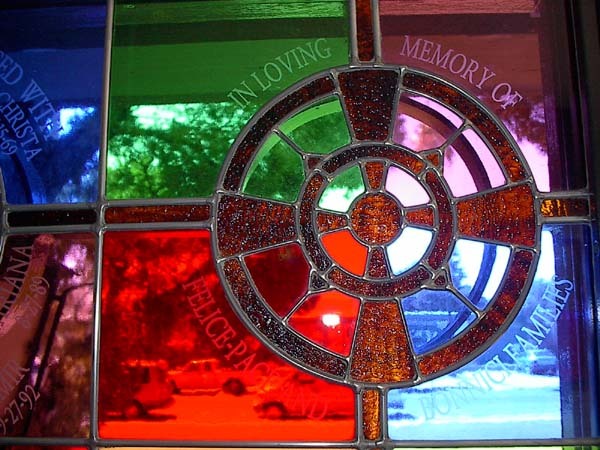 For more information on this project or how you can create your own perpetual tribute immortalizing a loved one at your place of worship, contact Ochoa Stained Glass Owner Genia Parker at genia@ochoasg.com.